ViewRanger, the outdoor guide, mapping and navigation app, is helping BBC Countryfile Magazine to bring its popular Great Days Out feature to smartphones, tablets, and watches. Digital route guides, for the routes included in the Great Days Out section within the magazine each month, are being published through the ViewRanger app to coincide with each printed magazine’s publication. Starting with issue 101 of Countryfile Magazine, on sale from Friday 3 July, a selection of routes suitable for a range of outdoor activities is included in each monthly feature, each of which can be downloaded from ViewRanger for free. A QR code printed in the magazine means that readers can simply scan this code to download the route to their Apple or Android smartphone and tablet. 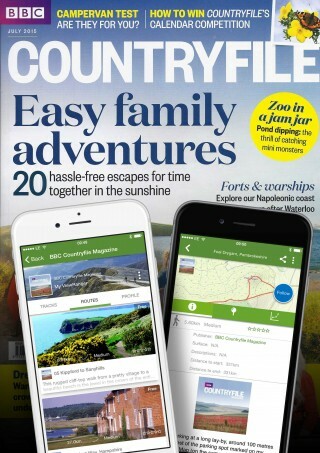 Fergus Collins, editor of BBC Countryfile Magazine, said: “Using ViewRanger has helped BBC Countryfile Magazine to make rich digital route guides, mirroring those included in our Great Days Out features, easily accessible to its readers on their smartphones. ViewRanger also recently introduced Route Collections into its app, enabling users to find routes grouped by publisher or theme. BBC Countryfile Magazine readers will now be able to find the magazine’s latest routes in issue-specific collection in the ‘discovery’ tab within the app, an area dedicated to discovering information-rich trail guides worldwide. Craig Wareham, ViewRanger co-founder, said: “Using ViewRanger, route guides can be followed easily with the user’s current position displayed on a detailed map – the active navigation system alerts the user if they veer off track. “Photographs, waypoint information, and other helpful content for each route are included within the digital route guides. The guides are downloaded and stored on a mobile device, so that no mobile network signal is required when navigating along them on a map. In addition to providing a publishing and content distribution platform, ViewRanger helps publishers to promote their content by providing marketing tools including: QR Codes, mobile Deep Links which take users to specific content on the app, high resolution images of maps and plotted routes for use in print and analytics information showing the most popular route guides downloaded for example.